Pen-and-ink plan and details of the Sayyid Masjid at Mandal, Gujarat, by S.J. Pacheco (fl. 1875), dating to between 1884 and 1886. This image is from the Burgess collection, an album of 49 drawings of plans, sections, elevations, sculpture and architectural details of Muhammadan monuments in Ahmadabad and the surrounding areas made between 1884 and 1886. The drawings were prepared mainly by Indian draftsmen under the supervision of James Burgess (1832-1916) of the Archaeological Survey of India. Mandal is a town situated approximately 22km north-west of Viramgam near Ahmadabad, Gujarat. It contains some mosques of archaeological interest notably the Jami Masjid, Sayyid Masjid, Kazi Masjid and Ganjni Masjid. This image shows the plan and details of the Sayyid Masjid or Sayyid's Mosque. The drawing in the top left hand corner shows a plan of the layout of the mosque. It is square in plan with, topped by a large central dome surrounded by smaller domes and corbelled ceiling sections. There are three 'mihrabs' or prayer niches in the western or 'qibla' wall which is aligned to indicate the direction of prostration towards Mecca. 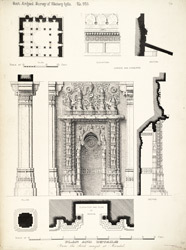 The remainder of the page is filled with architectural details from the same mosque. The central motif shows a 'mihrab' or prayer niche, an arched recession decorated with intricately carved architectural motifs, and a lotus in high relief at its centre.